This is not a full list of events or details but it will give you the essenece of the group. In 1962 Bernard Mahony and one of his siblings Adrian joined up with brothers Peter and George Fay to form The Four Kinsmen. The first that they song sung was Michael row the boat ashore in the living room of the Mahony’s home. Their first TV appearance was on the Kevin Dennis Auditions. After appearing on the show multiple times, they went on to win. The show went to air at 8 am on Saturday morning live on the 12th of October 1963. They won and were given a spot-on Graeme Kennedy’s “In Melbourne Tonight”. In 1964 they released their first single with label VAMP the A side was “The Sphinx Won’t Tell” and the B side was “The Last Leaf”. It was recorded at Television City in Melbourne, AKA GTV-9 TV studios Bendigo Street, Richmond By Bob Phillips, The Sphinx Won’t Tell reached number 10 on the Melbourne 3DB chart. More success followed with TV exposure it was then they decided to take the plunge and leave for England this was due to the fact that it vas very hard for them to find employment. All the venues wanted them but asked them to come back when they had more experience. This was very much a catch 22 situation. After much hard work they were given a three-month season with Dave Allen at a theatre restaurant which gave them a much-needed opportunity to cement their position. Over the next three years, they worked with Englebert Humperdink, Des O’Connor, Val Doonican, Benny Hill, Moorecombe and Wise and toured Spain, France Germany and Sweden. While in England they released three singles which a young Peter Shelly helped them produce and they did a pantomime season along with the New Vaudeville Band. In 1968 they then decided to return to Australia and as the seasoned professionals that they now were had no problem gaining work on the club scene in Sydney With their brand of humour singing and new approach to entertaining they were always in demand. 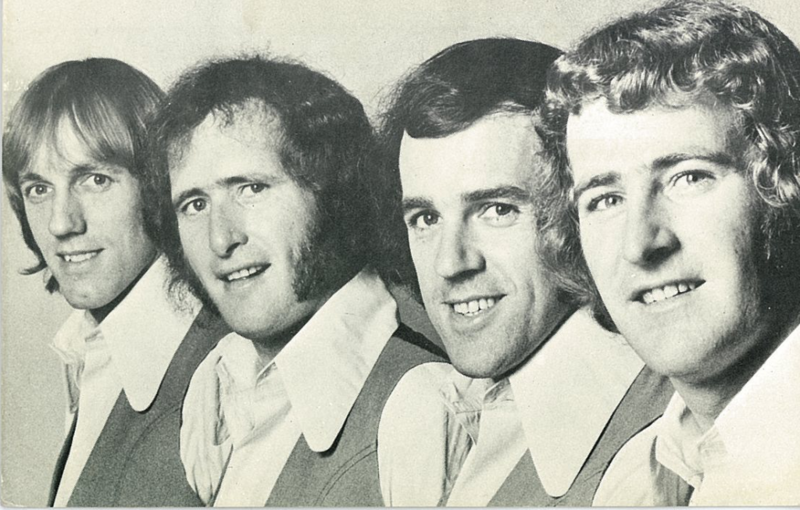 In 1975 their hard work was rewarded with a prestigious “Mo Award”, they were voted best vocal group and shared “Entertainers of the Year” with Don Lane. The group was in great demand overseas with work in South East Asia and Las Vegas keeping them busy. By 1976 all the travel was starting to take it’s toll and Bernard left the group and was replaced by Spencer Whitely. In 1978 they were on the Bob Hope Show that was filmed in Perth this was broadcast to 37 countries and was seen by more than 500 million people. In 1980 Peter Fay decided to leave and he was replaced by Alan Morrison, Alan didn’t last a great amount of time so Peter came back until George Harvey would step in. In 1982 two members left the group Spencer decided to leave and was replaced by Robert Pearson. And Adrian left and was replaced by Graham Wilson. In 1984 John L Hanson took over the management of the group from Wally Wrightman. 1983 Presented with the Keys to the City of LOUISVILLE, KENTUCKY as Australian ambassadors and made honorary Colonels of the Commonwealth of Kentucky. 1988 Headlining act for CONRAD JUPITER’S CASINO production show, “STARS”, on the Queensland Gold Coast. 1989 Headlining act for CONRAD JUPITER’S CASINO production show, “GALAXIES”, on the Queensland Gold Coast. 1990-91 2-year run as the headlining act for CONRAD JUPITER’S CASINO production show, “HOLLYWOOD LEGENDS”, on the Queensland Gold Coast. Headlined at the sponsors/competitors gala evening in San Diego for the America’s Cup Challenge. Headlined at the HACIENDA HOTEL on the strip in LAS VEGAS, becoming the first Australian performers to perform their own show in a major hotel on the Strip, being listed by “Las Vegas” Sun critic Joe Delaney in the ‘Top 8 shows on the Strip’ alongside every major act in the world.